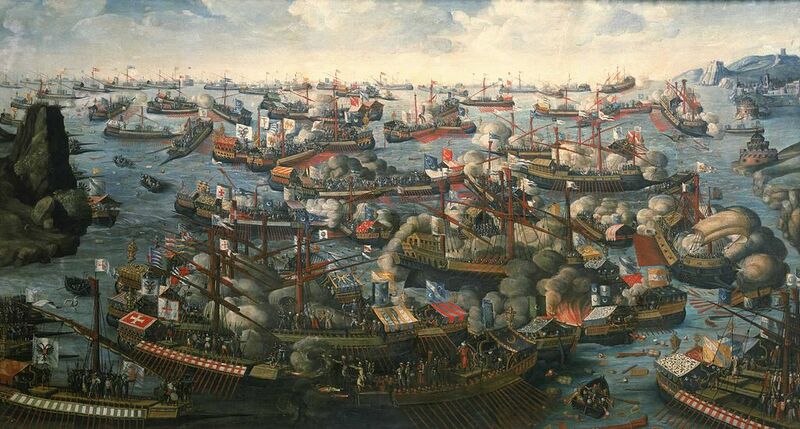 The Battle of Lepanto took place on October 7, 1571 when a galley fleet of the Holy League, a coalition of the Republic of Venice, the Papacy (under Pope Pius V), Spain (including Naples, Sicily and Sardinia), the Republic of Genoa, the Duchy of Savoy, the Knights Hospitaller and the Habsburgs, decisively defeated the main fleet of Ottoman war galleys. The battle was a response to the Ottoman (read: Islamic) seizure of Cyprus from Venice a few months earlier. The five-hour battle was fought at the northern edge of the Gulf of Patras, off western Greece, where the Ottoman forces sailing westwards from their naval station in Lepanto met the Holy League forces, which had come from Messina. Victory gave the Holy League temporary control over the Mediterranean, protected Rome from invasion, and prevented the Ottomans from advancing into Europe. This last major naval battle fought solely between rowing vessels was one of history’s most decisive, ending Ottoman sea-power as well assuring European ascendancy vis-a-vis the Ottoman Empire. One of many epochal clash between the two rivals, it was part of what has been described as a wave-like motion of European-Ottoman encounter, as territory changed hands to and fro following a victory or defeat by either side. That epochal battles such as Lepanto took place is a fact of history.